A hotlist in Google Issue Tracker is a list of specific issues, where you manually add or remove the issues. A new issue only appears in a hotlist if you or another user explicitly adds it and it remains in the hotlist regardless of any changes that are made to it. Hotlists allow you to track a set of issues related to a common goal, such as a product launch or particular feature. For other ways to collect issues into groups, see Grouped Issues. After you create a hotlist or add a hotlist, the hotlist appears in the left-hand navigation. Generally, the hotlist appears in the Hotlists section, but if it is also part of a bookmark group that you created or subscribe to, the hotlist appears under that bookmark group in the Bookmark Groups section instead. Hotlists are uniquely identified by an ID number, not their name. As a result, different hotlists can have the same name and may be difficult to differentiate. You should choose a unique name when creating a hotlist. When users access the list of issues in a hotlist, the initial view of the list is based on issue sorting specified by a user with Admin permissions as described in Organize Search Results. When a hotlist is sorted by position, issues can also be dragged and dropped in a customized order. This allows the Admin user to present hotlist results to other users as they deem appropriate. Unlike saved searches, the issues within a hotlist only change when a user explicitly adds or removes issues from the hotlist. Users with View and Append or Admin permission for a specific hotlist can add and remove issues from it. You can add an issue to multiple hotlists. Hotlists appear in blue boxes next to the issue's title on the issue's page. If Show Hotlists is toggled On for the Title column of a search results page, hotlists similarly appear in the search results as blue boxes. If you have View and Append or Admin permission for a hotlist, you can quickly remove an issue from the hotlist by clicking the X associated with the blue box. The hotlist summary page lists the name, description, owner and ID number for each applicable hotlist. Clicking on an entry takes you to an administrative page for the hotlist, with Basic Information and Access Control tabs. If you have Admin permission for the hotlist, you can directly edit the fields in these tabs. The hotlist picker allows you to quickly toggle the hotlists that an issue is listed in. It is available in the App Bar of the issue details page, or as a button in a bulk edit. The number in parentheses indicates how many hotlists this issue is listed in. Such hotlists have a checked box when you click on the hotlist picker. Other hotlists may also appear with their boxes unchecked. You can quickly add or remove an issue/hotlist association by clicking on the name of the desired hotlist. You can makes several changes at once by checking and unchecking the relevant boxes, but these changes only take effect if you then click the Apply button that appears at the bottom of the hotlist picker. 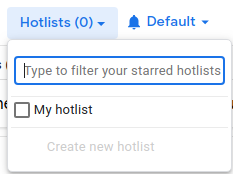 You can create a new hotlist or filter your existing hotlist by typing keywords into the Type to Filter Hotlists text field at the top of the hotlist picker. The search matches hotlists with the keywords in their title, but not their description. You create a new hotlist with the keywords you enter into the search bar by clicking Create New Hotlist near the bottom of the hotlist picker. You can only create a hotlist in the hotlist picker if your keywords do not exactly match a result from the search. When you create a hotlist in the hotlist picker, the associated issue is automatically added to the hotlist. When multiple issues are selected, no number appears in parentheses in the hotlist picker. When some, but not all, selected issues are found in the same hotlist, the hotlist has a dash in its associated box, instead of a checkmark. Clicking a dashed box changes it to a checked box. Individual issue details pages display hotlists in the hotlist picker that you are subscribed to. This includes hotlists that you created or starred, as well as hotlists found in bookmark groups that you have starred. In bulk edits, the hotlists displayed in the hotlist picker include the above hotlists, as well as any hotlists associated with issues listed in the displayed search results. Only users with Admin permission for a hotlist can archive it. When archived, a hotlist no longer appears in the left-hand navigation of users who starred it or had it in a bookmark group. An archived hotlist does not appear in a hotlist search, but can be found in the Archived section of the left-hand navigation of the hotlist admins. When you go to the list of issues for an archived hotlist, the text (archived) appears in red next to the hotlist title.